BEIJING, Sept. 1,Chinese President Xi Jinping met with Beninese President Patrice Talon on Saturday ahead of the 2018 Beijing Summit of the Forum on China-Africa Cooperation. Stressing that the 21st century is the century of Asia and Africa, Xi said Africa has huge potential of development and that the African lion is set to make a roaring comeback and gallop forward in the new era. China and Africa are good brothers, good friends and good partners, Xi said. "We will not forget the profound friendship and precious support of the African people for the Chinese people," the president said. Having made progress in its own development, China will work more firmly with African countries to support and help each other, seek common development, and build a closer community of shared future, he said. Xi noted that China is willing to exchange the experience of governance and improve people-to-people ties with Benin, and to jointly develop the Belt and Road to make it a new bond between the two countries with ancient civilizations. Talon said African countries including Benin are working hard through reforms to increase the capability of governance, seek long-term development and change their fates. Noting that the Chinese people, led by President Xi, are advancing toward the goal of national rejuvenation, Talon said China's experience of success is worth learning and that China's support and help is of great value. 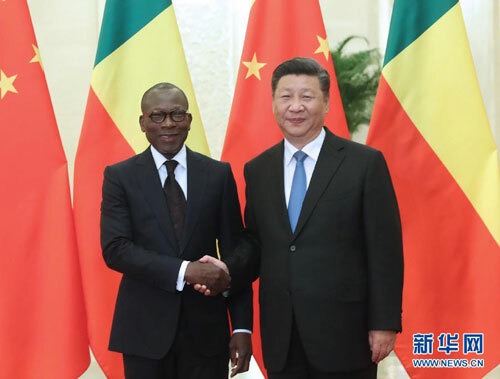 Benin is willing to strengthen exchanges with China, he said, expressing confidence that, with cooperation with China, his country and Africa will realize faster development.